We want to have a positive role in reducing energy and carbon emissions, and have a target to reduce carbon emissions by 43 per cent by 2020 compared with a baseline year of 2005/06. To achieve this, we are investing in our estate, existing and future, and partnering with our staff, students and local community to drive cultural change. The Carbon and Energy Reduction Officer monitors and targets electricity, gas and water consumption on a regular basis, and undertakes a rolling process of full building energy audits on an annual basis. The audit results then help to prioritise and create energy improvement projects across the campuses. 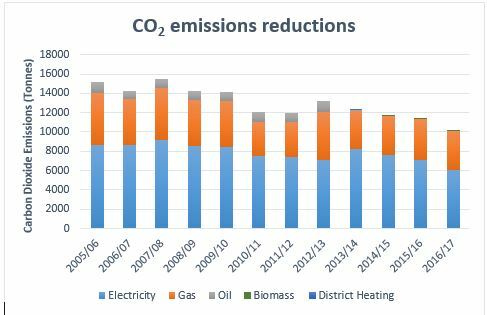 Our Scope 1 & 2 carbon emissions have fallen by 32.73 per cent by 2016/17. This is mainly due to relocating from energy intensive older building stock to new buildings. The graph below shows our energy consumption, split between different fuel types. Energy efficiency - We have a range of energy saving measures such as lighting controls, variable speed drives, LED lighting, insulation and draught proofing. We are in the process of developing a business case for a Salix loan to help fund air handling unit fan upgrades, boiler replacements and an LED retrofit to help reduce our energy consumption. New builds - All new builds must follow our Birmingham City University ‘Sustainable Buildings Standard’ with a minimum of BREEAM Excellent and an Energy Performance Certificate rating of B. 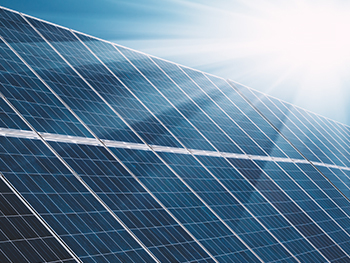 Solar PV - We have over 200 panels on four buildings which generate just under 100,000 kWh a year, which is equivalent to the energy use of 25 average UK homes in one year. CHP and Biomass – Our new Conservatoire building has a 20 kW combined heat and power system (CHP) which produces electricity and heat for the building. We also have two biomass boilers, one in Curzon Building and the other in Parkside Building, both 750 kWth. Green electricity and gas - Electricity is the biggest single source of carbon emissions in Britain. We buy 100 per cent green electricity and 100 per cent green gas to reduce our impact. Carbon management plan – View our existing Carbon Management Plan. We are currently refreshing and updating this plan, which will be available soon. 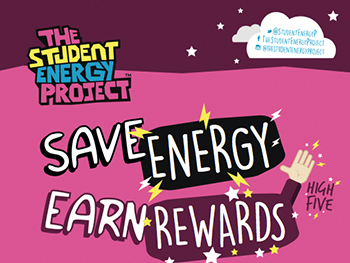 The Student Energy Project is in operation at Birmingham City University with the aim to encourage students to reduce their electricity, gas and water use in their halls of residence. For every unit of energy and water saved, students will earn points which can be exchanged for vouchers at the end of the academic year. Click here for more information. Birmingham City University currently report to HESA on CO2 emissions from our business travel, commuting, procurement, waste, water use and treatment. As part of the refreshed carbon management plan we will be looking to expand on this. We will be increasing the amount of sub-metering that feeds into our energy management system over the next couple of years. As part of the carbon management plan refresh we will be considering our energy strategy beyond 2020/21. This will include opportunities for increasing our onsite generation, energy storage and demand response.